We invite you to explore India - the Land with infinite beauty ! Whether you soar high into Himalayas or peer under the ruins of the Ancient monuments dotting the landscape of India, you will cherish the experience long after your visit ! This India Travel Guide on Basilica of Our Lady of Vallarpadam is free from any commercial interest! This site is dedicated to promote India - the vast subcontinent, its glorious past, magnificent landscape and its infinite variety. This Basilica which is a national Shrine has a long history. In the year 1524, Portuguese missionaries who came with Vasco Da Gama established a chapel dedicated to the Holy Spirit with a picture of Blessed Virgin Mary in the form of Our Lady of Ransom. This is the first Church in Asia dedicated to the Holy Spirit. This chapel was washed away in a flood in 1676. The picture of the Lady of Ransom was washed away too. The picture was retrieved from the waters by the Divan of the Maharaja of Cochin - Paliyath Raman Valiyachan, himself a devotee of Our Lady of Ransom. Valiyachan donated his land to the construction of a new church in honor of the divine mother and also established a sanctuary lamp (Kedavilakku) in the church. The Paliyath descendants continue the tradition of keeping this perpetual lamp burning to this day. 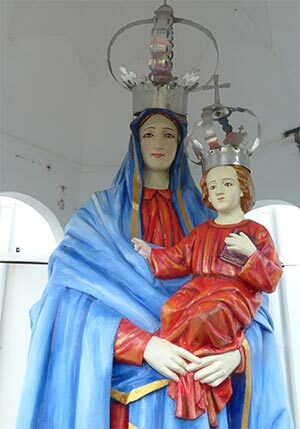 Our Lady of Ransom in this church is addressed to this day as Vallarpadamma - a malayaalam combination word indicating the Mother who resides in Vallarpadam. Miracles of Vallarpadamma: In the year 1752, a woman by the name of Palliveetil Meenakshiamma and her child were miraculously saved through the intercession of Vallarpadamma after 3 days when they almost submerged in the flood waters. At the time when the woman and her child were swept away in the flood, the woman prayed to the Lady of Ransom that if we she and her child were saved , she would become a Adima (slave) of Our Lady. The spiritual practice of submitting oneself to the protection of Vallarpadamma thus originated at this time and became a popular form of devotion. This Adima ritual is performed by the fishermen and sailors to invoke the divine protection before they venture out to the sea. From this day, travelers in this part began praying to the Lady of Vallarpadam for their safe journey. In the year 1888, prompted by the continuing miracles attributed to the Lady of Vallarpadathamma , Pope Leo XIII elevated the main alter of this shrine to the status of Altare Privilegiatum in Perpetuummeaning 'privileged altar for the celebration of daily mass'. The Government of India declared this shrine as a 'Major Pilgrimage Center of the Country' in the year 1951. In the year 2004, this church is declared as a National Shrine. The Venerable Pope John Paul II elevated this Church to the status of a Minor Basilica in the same year. Vallarpadam , Cochin - 682 031 , Kerala , India. The white walled cathedral with its imposing twin towers - looks grand from anywhere in the vicinity. The towers are almost 85 ft from the base. There is a larger than life size Lady of Vallarpadatha Amma housed in the top dome of the central tower. The twin towers have a lift facility to take visitors to the top to have an overview of the land, the Vembanaad Lake and the glistening Arabian sea. The terrace of the tower is enclosed in a steel cage for the safety of the visitors. In the front of the church, there is a large oval sized park called as the Rosary Park. 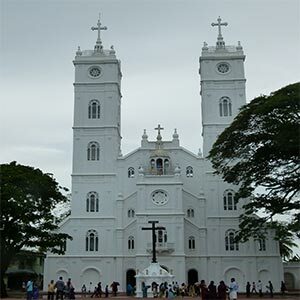 After the construction of the Goshree Bridge which links Ernakulam main land to this Vallarpadam island, it has become easier for the pilgrims to go to this Basilica. Or you can take a ferry service which runs every few minutes from the main land to Vypin ferry station. Feast of Our Lady of Vallarpadathamma is celebrated from September 16 to 24 every year. Pilgrims flock to this Shrine regardless of their religion, caste or creed.